Good morning! It's time for another Twisted Tuesday challenge and this week's challenge is to create something cool. With autumn around the corner, cooler temps are on my mind you can interpret this theme anyway you like and the twist this week is to sponge some edges. I decided to use my Cold & Cuddly stamp set and my inked edges are the ink around the ice and around the edges of my card base. My card was really easy to make, I simply stamped and cut out the images. The coffee mug was a little tricky so for that I inked up the wavy steam part of the image and stamped it onto my card base and then I was able to stamp and cut out the mug image and place it just under the steam. I did it this way because it was too hard to try and cut around the steam- I guess you could just draw it on your card too. The bottom of my dsp was punched using my scallop border punch and then I added my ribbon. I decided to stamp and punch out my sentiment and then I tied the twine over top of my ribbon knot. I did use one dimensional to help hold my sentiment in place. It's hard to see in my photo so I wanted to mention that I put some dazzling diamonds glitter on the ice. Be sure to take a minute and check out the other DT member's cards! By the way Melina is having a design team call for her Twisted Tuesday's Blog. If you would like to apply you can find more information about that here. Have a great day! Patty, I do believe this is one of my favorites of all your cards that I've seen. That bear on his "glacier" makes me smile! And the layout... WOW! 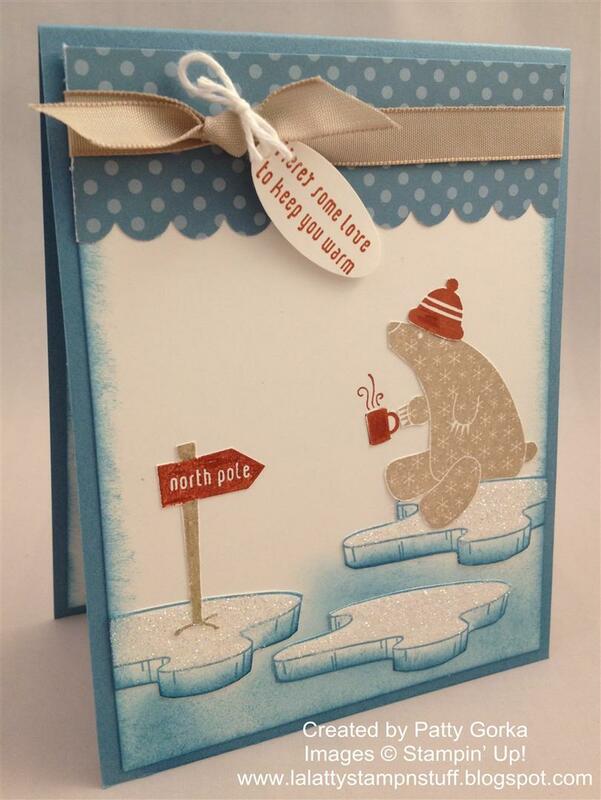 I've cooled off just viewing this adorable card! I'm also impressed in your goal to make 100 cards in 100 days. You're smokin'! Wow! It looks 3d. Awesome card! Oh, this is adorable, Patty! There is a lot to learn in this one little card. Awesome sponging, paper piecing, layout, ribbon-on-ribbon, a tag, scalloping. How you manage it all and still make it look uncluttered and "just right" is amazing! The colors you used are really great together. I like how you created the icy water and the floating ice pieces. Very cute card! Patty--I love, love this card. It does make me feel like winter is coming soon! Cute card!! You're on #76!! Eeeek!! You're getting ahead of me. I was counting on you to stay with me...okay, maybe I was counting on me to keep up with you. LOL. But don't worry about me, I have a trick up my sleeve! !